Beginning today, the feast of the Virgin of Paucartambo begins and people trek hours over the mountains to this valley near the jungle to dance and watch troupes of sacred figures course through the city. They also come to feast, to eat till filled with the festive offerings of the sponsors of the feasts and to enjoy the street foods and restaurants that appear for these days. 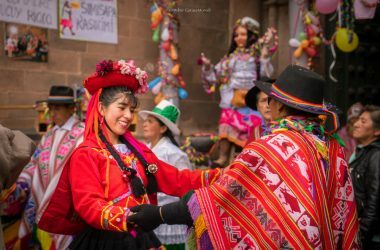 Cuzco’s calendar of feasts not only stresses events that take place in the city, it also involves some regional feasts, when dance troupes who have practiced all year travel out of devotion and social obligation to make their costumes come alive. The figures of history and cosmology come alive as they claim the spaces of these regional centers. 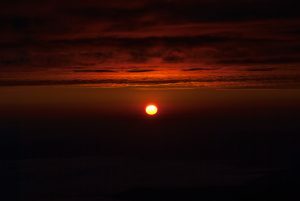 In June, the entire city was abuzz over Qoyllur Rit’i and he pilgrimage to the Lord there and to the Snowy Star. In September, they will go to Huanca to celebrate the Christ that is on a stone outcropping there and tied to colonial mining. This week, they go to Paucartambo to bring highlands and lowlands together with the struggle between the contradictory, vital forces of life. 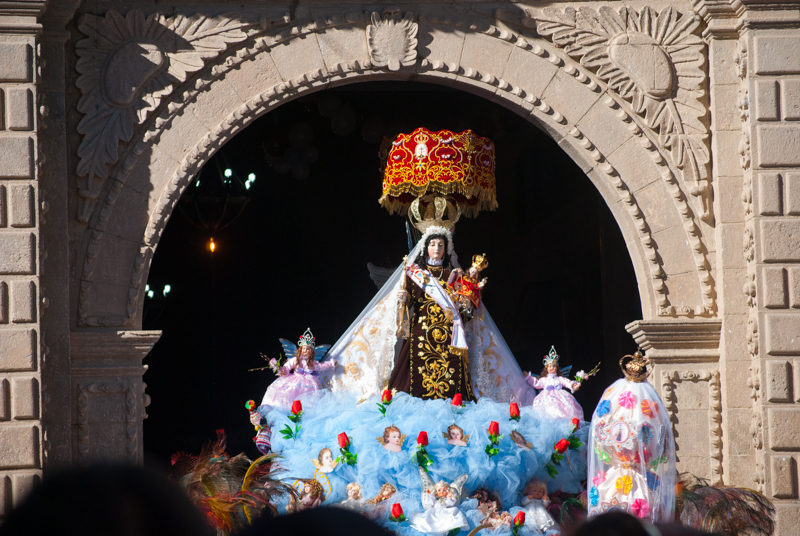 This brilliant joining of Andean genius with Catholicism and performances with partying celebrates the Virgen of Mount Carmel (la Virgen del Carmen) and the community that performs devotions to her. 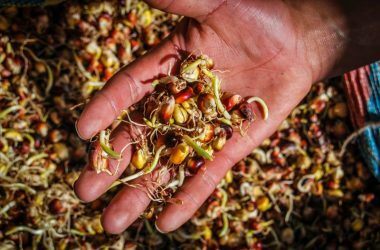 This community that “feeds” here with its sacrifices and actions is brought to ground in Paucartambo but involves people mostly in Cuzco, across Peru, and even internationally. It is as if from here relationships radiated outward like a star, or a khipu (a knotted cord) to organize a universe. 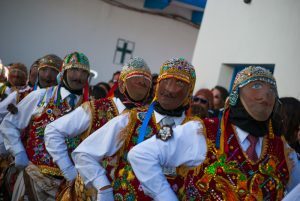 In Paucartambo, though a feast of townsmen and people of mixed European / Indigenous heritage, the Virgin is honored as someone who was composed of parts: her body wounded by jungle dwellers (Ch’unchus) and thrown in the river whose name honors her (the Mother of God River–Rio Madre de Dios) and whose head was found in the highlands by herders and merchants, Qollas, who brought it to Paucartambo. The Virgin is, therefore, the union of highland plains and lowland waters, of herders and jungle people. 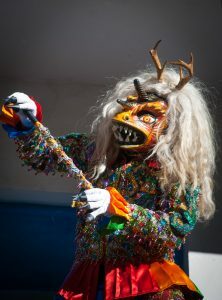 Her feast also brings them together in a retelling of history as Qhapaq Qollas and Ch’unchus dance through the town as images of long lasting types that come alive in feasts. The Virgin is also associated with Purgatory and in this feast the devils come to tempt and provoke. Yet these devils are called Saqra, an Andean word that refers to fertility and water, as well as the world within. These devils, bedecked with horns and jewels climb the roofs and balconies of Paucartambo to try to draw the Virgin and her followers away as she sedately and with dignity processes through the town. 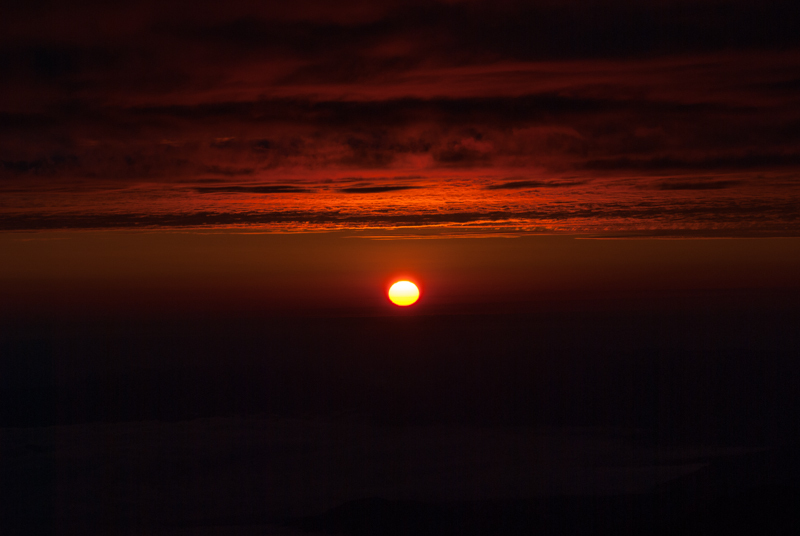 But this drama of the sky and world within (heaven and hell) as a play of sacred history and fertility is not all. 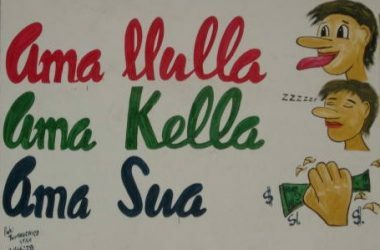 Paucartambo is also a story of the dangerous traders, on one side, who bring gifts, and the jungle people who threaten in holy battle, highland and lowland in conflict and contrast. More than anything else, Paucartambo is about devotion. The dancers seduce with power, the tricksters and clowns provoke and order, and food and drink flow. Paucartambo is passion, Christian, Andean, nation, and life. 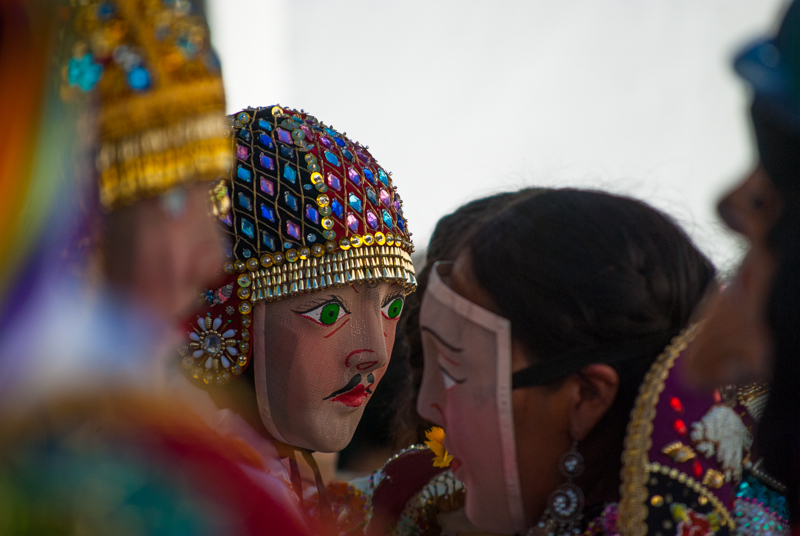 It is one of the great events in Cuzco and a must see and do at some point or points in everyone’s life. 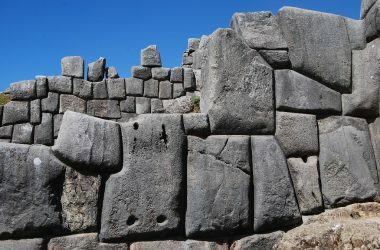 This blog from Peru’s Catholic University has the best overview of Paucartambo’s feast I have seen online. 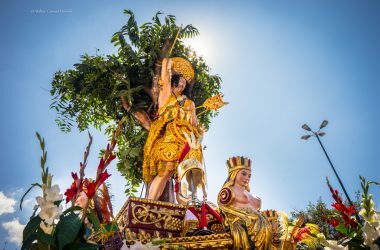 Though in Spanish, this is worth running through Google Translator if you wish for a detailed overview of the feast and the different Dance groups.